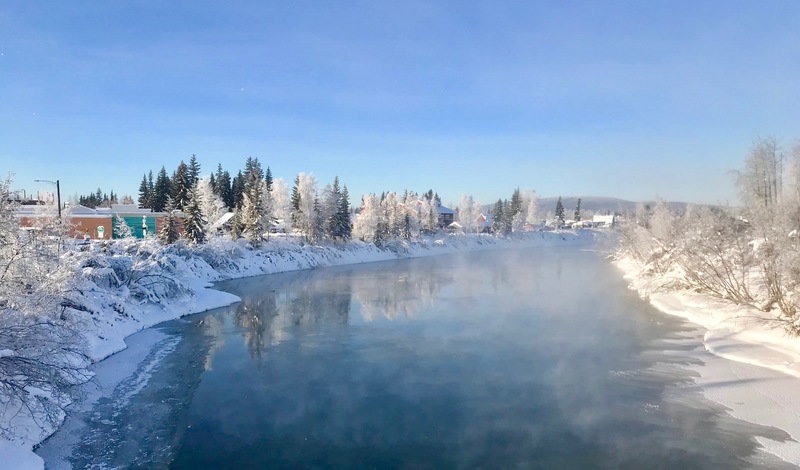 This entry was posted on Tuesday, February 19th, 2019 at 7:07 AM	and tagged with chena river, Fairbanks, photo and posted in Alaska. You can follow any responses to this entry through the RSS 2.0 feed. I always liked to capture the steam rising of any body of water. I stopped because I knew there would be steam rising over the open water. The pic was taken from the footbridge over the river between Pioneer Park and the Carlson Center. Like all Interior rivers this winter, the Chena has been thin on ice. Just days after this picture was taken, two snowmachiners, in separate incidents, went through the ice near Pike’s Landing.